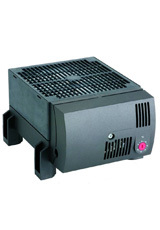 The compact high performance fan heater prevents formation of condensation and provides an evenly distributed interior air temperature in enclosures with electric/electronic components. The plastic enclosure provides double insulation and acts as protection against contact. The fan heater is available with integrated thermostat or pre-set hygrostat for temperature or humidity control. The CR 030 was designed as a stationary unit for the bottom of the enclosure. For wall fixing the fan heater CR 130 is recommended. 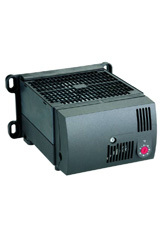 The compact high performance fan heater prevents formation of condensation and provides an evenly distributed interior air temperature in enclosures with electric/electronic components. The plastic enclosure provides double insulation and acts as protection against contact. The fan heater is available with integrated thermostat or pre-set hygrostat for temperature or humidity control. The CR 130 was designed as a stationary unit for wall fixing. For fixing on the bottom of the enclosure the fan heater CR 030 is recommended.